Yeowww! 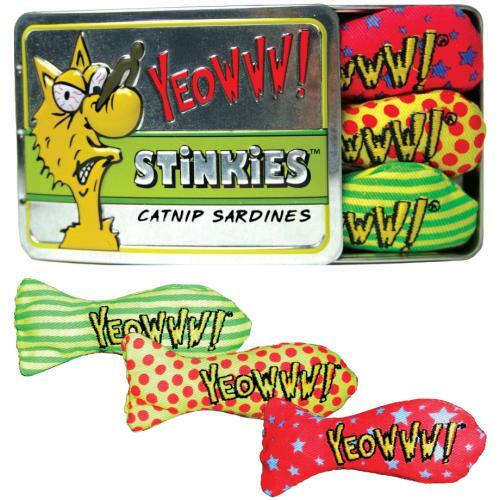 Catnip Stinkies are long little fishies, hand stuffed full of nothing but pure, organically grown catnip to bring out your feline friend's wild side. Free from cotton and polyester stuffings, or indeed any stuffings other than natural, organic catnip and made in the USA from heavy duty cotton using only natural vegetable and soy based dyes. Yeowww! make catnip toys that actually work, sending your kitty silly for up to 15 minutes at a time. Yeowww! Catnip toys are made from strong cotton, but especially determined cats may be able to open them at the seams. Thankfully, catnip is completely safe for consumption by cats and people, and the fabric is easily sewn back together in time for the next play session!